You've probably read the news that AP broke yesterday morning about the upcoming sequel of To Kill a Mockingbird. The novel to be released this summer already has a ton of buzz and rightly so; this is the only other novel written by Harper Lee to be published. It tells the story of the adult Scout; when editors first read it when originally written they were more interested in reading Scout's childhood story, which Lee then wrote and is what we know as To Kill a Mockingbird today. Not everyone is excited about the new release though. Some feel that the aging and very private Lee might have been bullied into agreeing to publish the story following the death of her sister a few months ago. I hate to think that anyone would ever take advantage of a person that way, so instead I think that someone was just finally able to give Lee the needed confidence to publish some of her other work. Hopefully Go Set a Watchman will be well received and she'll agree to publish some of the other works I'm sure she's privately written over the years. But back to the original point of this post. This news made me think about all the classic books we were assigned to read in school. I really love to read, something I'm so thankful my mom instilled in me at a young age, but I'll be the first to admit that sometimes I didn't love reading these assigned books. The only way I got through reading some books was by telling myself that some books you just HAVE to read. 1. To Kill a Mockingbird - The book that shows that even when you know you won't win, some fights are still worth fighting. I can distinctly remember reading this book for the first time, and I didn't love it. This is one I think you have to be a little older to truly appreciate, so I'd recommend rereading it now later in life. 2. The Great Gatsby - This has been one of my favorites long before Leo graced the silver screen with his portrayal of Jay Gatsby. While I think the newest movie adaptation was wonderful it really can't even begin to touch the actual novel. It's such a short read you really have no excuse for not reading it. 3. Pride and Prejudice - "It is a truth universally acknowledged that a single man in possession of a good fortune, but be in want of a wife." is arguably the most famous first line in literature. Even if you've never read the book you know the story and understand if someone is referred to as a Mr Darcy. 4. Romeo and Juliet - I hate Romeo and Juliet, absolutely hate it. But I can recognize what a classic story it is and how important it is to read. In my opinion it isn't a story about love, but rather a story about the importance of having some common sense. Never agree to marry someone you just met, especially if you're like 14 and the reason they even came to your party originally was to meet another girl. 5. Fahrenheit 451 - This is one that always surprises me when people haven't read it, but I feel like it's the most obscure of this group. It's difficult to explain why this one is so important without ruining the story, so I'll just say that of all the assigned readings I've been given this ranks in the top of most likely to willingly read again. 6. Night - I attended 4 different high schools, in every single one of them I was assigned to read this book, plus it was assigned in a college class. It that doesn't speak to the universal praise of a book, I don't what does. Plus I've heard the author speak, so maybe I'm a little biased. 7. the Harry Potter series - Okay so technically not yet considered a classic, but I really think one day it will be. If for no other reason, you need to read all 7 of these books because they are such a huge part of pop culture. On the surface they might just seem to be about a boy wizard, but if you delve in deeper you'll discover they're about much more. 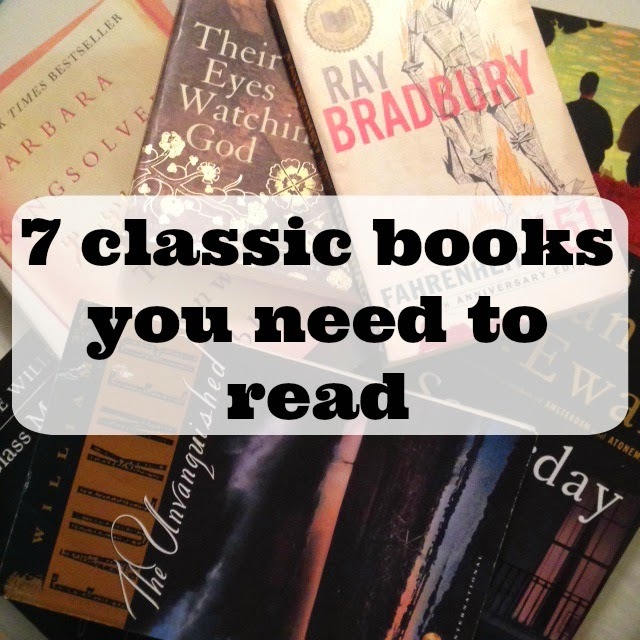 What classic books do you think everyone should read? Any old favorites from school assigned reading that you'd pick up again? Pride and Prejudice is SO SO good, one of my all time favs! I also HATE Romeo and Juliet, but I agree you should read it, even if it's just to learn from their stupidity. ;) I've never read Fahrenheit 451, thanks for the tip! love your picks! TKAM is one of my faves, but my all time favorite is the Scarlet Letter! So many of these books are definite must-reads because they have impacted our culture and the literary world so much. I have a soft spot for The Great Gatsby though because F Scott Fitzgerald because his house is in the same town as me! 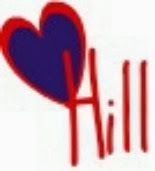 To Kill a Mockingbird and Pride & Prejudice are two of my very favorite books! My favorite quote of all time is from TKAM, "I wanted you to see what real courage is, instead of getting the idea that courage is a man with a gun in his hand. It's when you know you're licked before you begin but you begin anyway and you see it through no matter what. You rarely win, but sometimes you do." The Great Gatsby continues to be one of my very favorite books, only made better by the recent movie version. Harry Potter is a total given, I remembered loving Night back in high school and now you have me wanting to read it again!